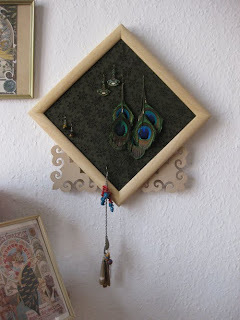 there are plenty of ideas for earring hangers floating around the internet, and I won't take any credit for the idea, but a friend asked me if I would share how I made mine. My original inspiration was this great blog, H is for Handmade, but I figured I could do it a step simpler (since I neither have lots of lace nor a sewing machine) so I just took one piece of material. However, Amy's version is better suited to all kinds of earrings as well as hair clips. I bought a small frame (about 20 x 20 x 5cm) from a local art shop and found the wooden decorative cutouts there too. I then tacked the material into the inner sides of the frame (so you probably need something sturdy), working from opposite sides to avoid wrinkles. I also took a 2x2cm cube as a backing for the cutouts so they aren't directly on the wall. It makes the whole thing stand out more. 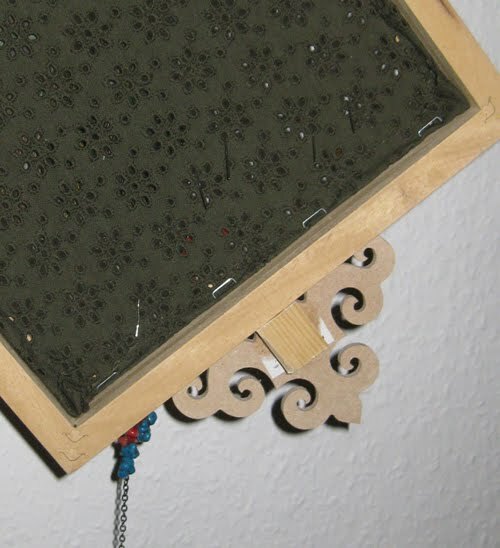 Just glued everything together and voila, hang away. I think it was done in ten minutes.